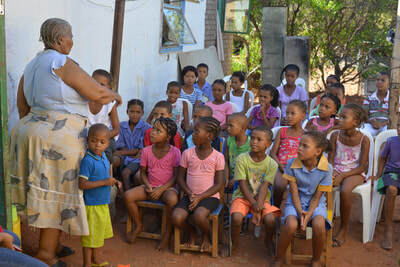 N/uu is the most endangered, still spoken language of Southern Africa. 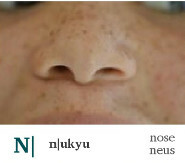 N/uu was thought to be extinct among expert linguists, but in the late 1990s, about 20 elderly speakers revealed their competence in this language. 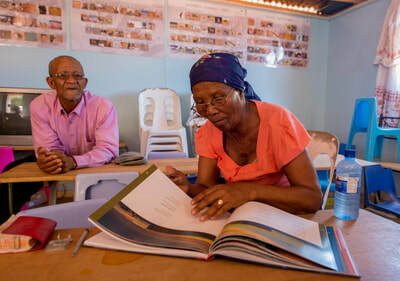 As of January 2018, only four elderly people from the ǂKhomani community still speak N/uu. N/uu is the last surviving member of the !Ui branch of the Tuu language family, with all other members of this branch - /Xam, ǂUngkue and //Xegwi - being extinct. Speakers of !Ui languages were the first people living in today's Southern Africa. They lived as hunter-gatherers before being forced into assimilation by intruding white settlers and their Nama- or Afrikaans-speaking clients. Until today, the members of the ǂKhomani community remain to be among the most marginalised and disadvantaged people of South Africa. 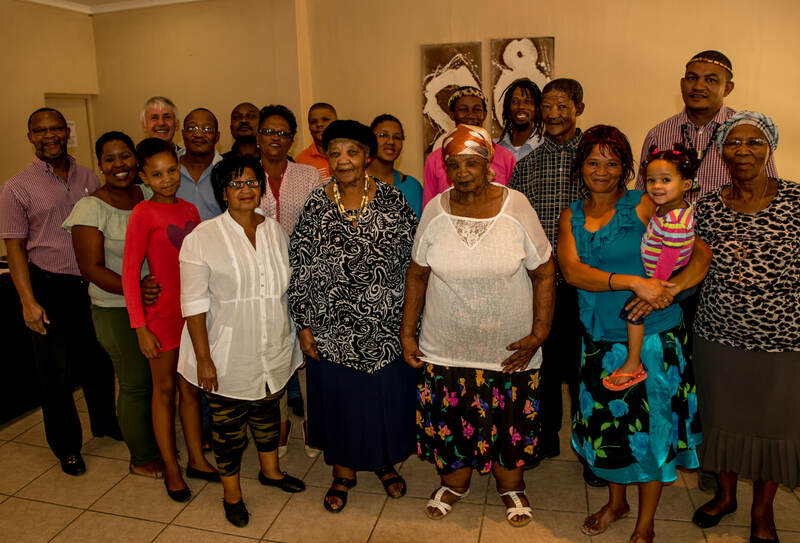 Hanna Koper, Griet Seekoei and Katrina Esau – three elderly sisters living near Upington, South Africa – and their brother, Simon Sauls, are the last remaining speakers of N/uu. None of them uses N/uu in natural conversation in their daily lives, but remember that they did so as children and adolescents. 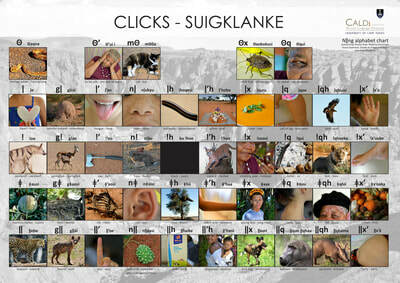 Instead, they communicate in Afrikaans, which is the mother tongue of the ǂKhomani community. 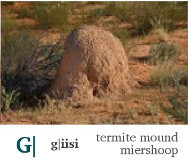 ​Since the late 1990s, scholars from Germany (Tom Güldemann, Alena Witzlack, Martina Ernszt, Sven Siegmund, Mats Exter), Namibia (Levi Namaseb) and the US (Bonny Sands, Amanda Miller, Chris Collins, Johanna Brugman) have been documenting and analysing the N/uu language. They established the sound inventory, published a grammar and also suggested orthographies. This research formed the basis for the CALDi project on the development of N/uu educational materials. One of the most important sources on the ǂKhomani community is the open access Hugh Brody archive at ​UCT Libraries Special Collections, which was launched in 2016. This archive contains a wealth of audio, visual and textual material of N/uu. Ouma Geelmeid is the only speaker actively teaching N/uu. For over a decade, she was assisted by her granddaughter, Claudia du Plessis. 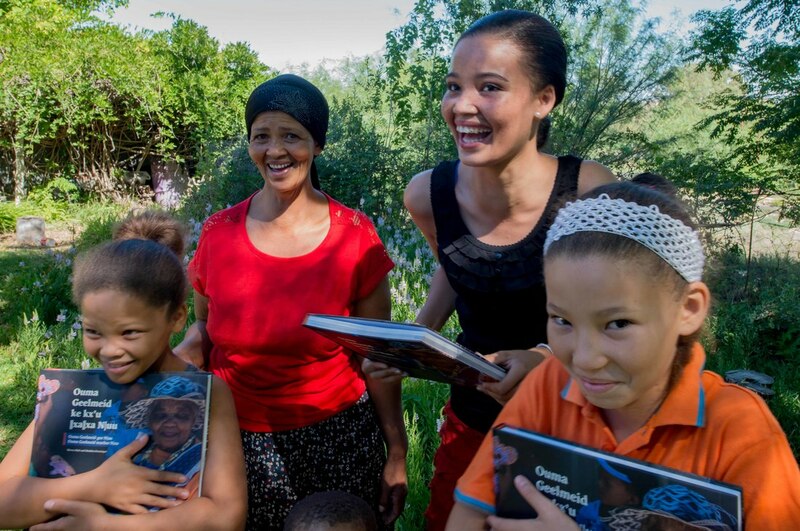 Ouma Geelmeid is non-literate, but Claudia is one of the few community members who can read and write N/uu. Since 2016, David van Wyk assists Ouma Geelmeid and manages the N/uu language school, Staar na die Sterre. Approximately 25-40 children from the neighbourhood are taught N/uu words, phrases and songs three times a week for roughly two hours per day. ​In 2013, when ​​I joined the Centre for African Language Diversity (CALDi) at the University of Cape Town, I took over the N/uu language project. Together with Matthias Brenzinger, the Director of CALDi, we worked with the community for the following three years. In consultation with the community members, we discussed the N/uu orthography, the development of alphabet charts and language posters, as well as the production of a N/uu reader. We discussed the previously suggested N/uu orthographies with the community members, who then decided on their preferred writing options for N/uu. Practical orthographies are established and owned by the communities and the role of linguists is to facilitate the orthography development process and provide information to the community to allow them to make informed decisions. 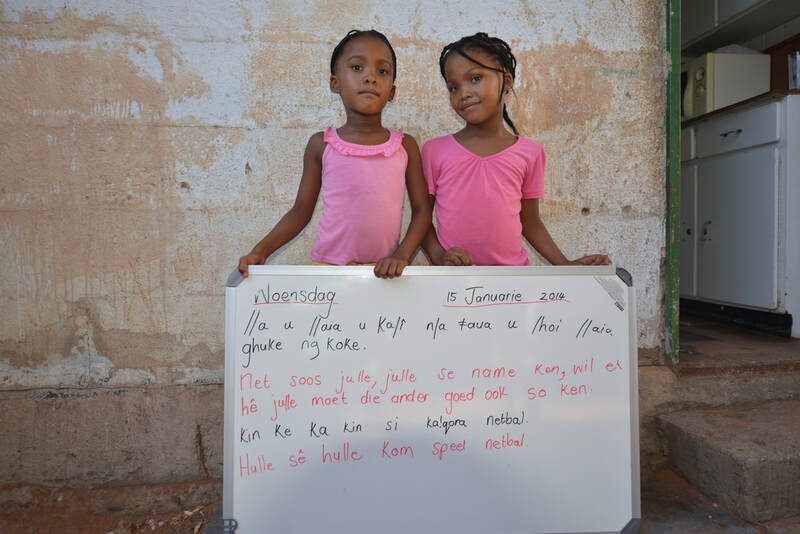 The practical orthography was launched at a workshop in Upington on March 24, 2014. ​For more details on the orthography, see our paper "Writing for speaking: The N/uu orthography" in the CUP edited volume Developing Orthographies for Endangered Languages. We designed N/uu alphabet charts and language posters using the N/uu practical orthography. 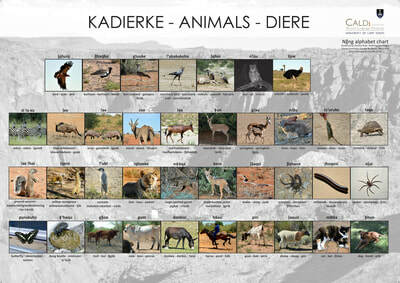 Language posters include an illustrated N/uu animal poster with translations in English, Afrikaans and ǂKhomani Nama, as several members of the community speak Nama. ​​Since March 2014, the alphabet charts and language posters are being used in teaching efforts. Click on the images on the right to listen to N/uu! ​The main outcome of this project is a 160-page trilingual N/uu-Afrikaans-English reader entitled ﻿Ouma Geelmeid ke k'xu //xa//xa N/uu﻿. 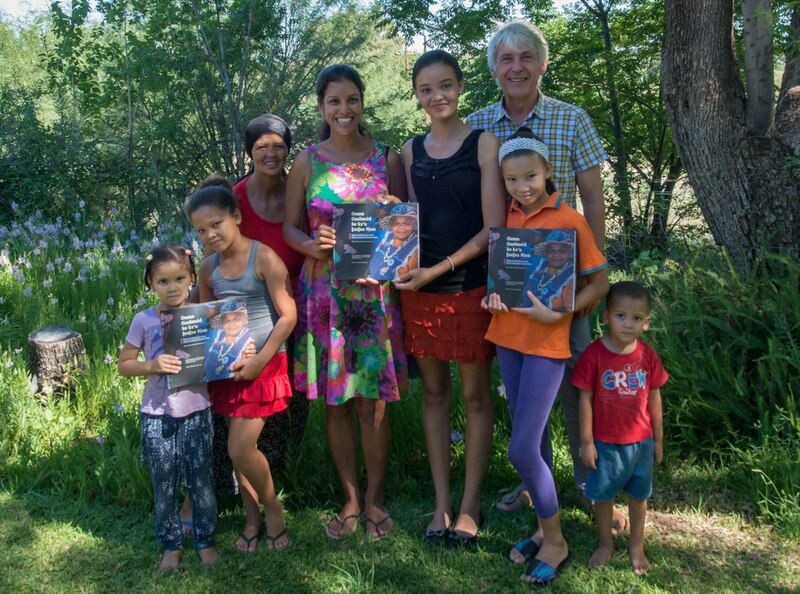 Ouma Geelmeid's school received 300 free copies of the printed version and the reader is also freely accessible on OpenUCT. 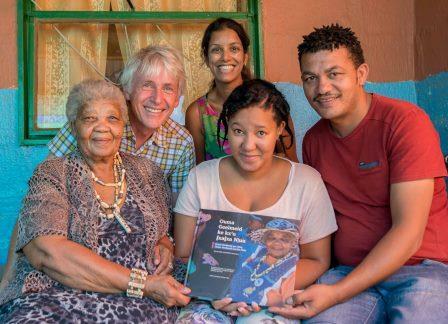 In 2017, the N/uu reader received the annual award from the ATKV (Afrikaanse Taal- en Kultuurvereniging), the Afrikaans language and cultural association, in the category of dictionaries. The N/uu reader comprises twelve thematic areas with phrases and sentences derived from everyday conversations, as well as games, prayers and songs. Core cultural terms and basic vocabulary used by Ouma Geelmeid were added in N/uu-Afrikaans-English and Afrikaans-N/uu-English glossaries. ​"With 114 distinct speech sounds, N/uu is one of the great masterpieces of the human genius to create language, and its sumptuous ensemble of clicks are iconic of Southern Africa. Now just three old sisters still speak it fluently, leaving them to wonder: what is our land without its language? This book is a brave step towards restoring an ancient and noble vehicle for the soul of the Kalahari, and ingeniously solves the problem of writing so many sounds with so few letters, providing translations of the N/uu material into both English and Afrikaans. I congratulate Ouma Geelmeid (Katrina Esau), Sheena Shah, Matthias Brenzinger, Claudia du Plessis, Mary-Ann Prins and CALDi on producing this book and hope that many people will use it to learn about, and learn, this magnificent language, so that more people in the future can truly say "Na ǂxoa N/uu" 'I speak N/uu / Ek praat N/uu'." "Preserving the cultural heritage of a nation is a task where linguists can play an important role. 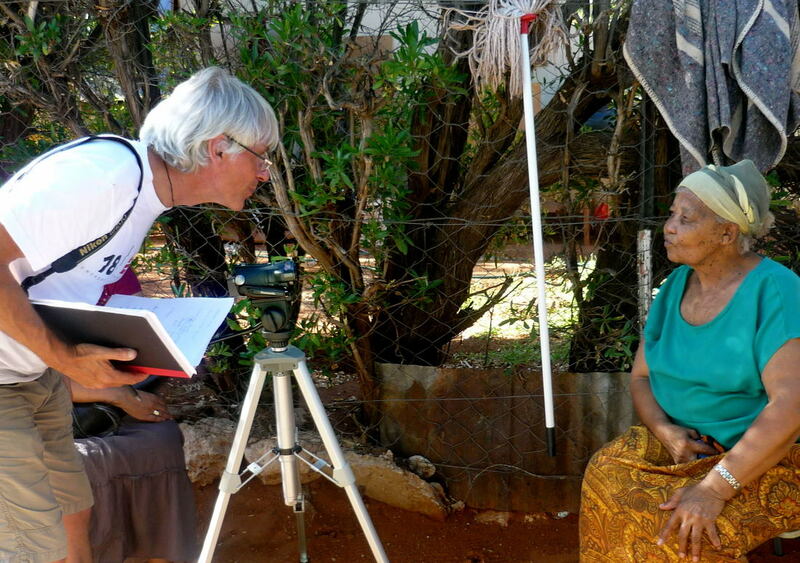 The present reader is the result of a commendable project where language experts in cooperation with the speaker community were not only able to document relics of South Africa’s precious linguistic prehistory but also to make the documented resources available to the public, making it possible that the nearly extinct N/uu language be preserved and put to new uses. I am satisfied that this reader will serve as a model for other endangered language projects in Africa and beyond." 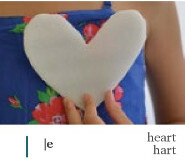 "The world extends from A to Z, especially the world of languages. Or that is what alphabetocentric Europeans think. 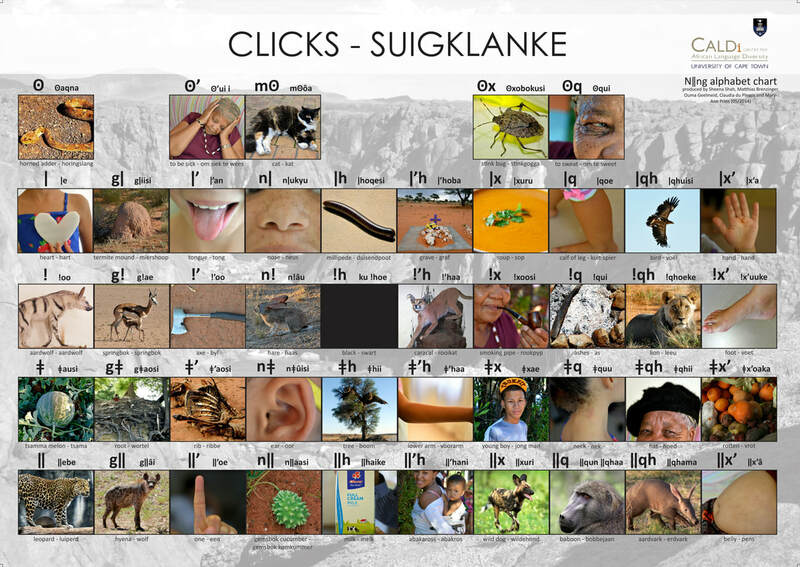 And then N/uu, a South African language with an inventory of 114 distinct speech sounds, including a number of rare sounds unknown in most other languages. The 26 letters of the Latin alphabet clearly cannot capture the relevant distinctions. Based on previous linguistic studies of the language and in close collaboration with community members, Sheena Shah and Matthias Brenzinger created a written form for N/uu which is elegant and easy to understand, supplementing the Latin alphabet with diacritical marks and additional letters. Presenting written N/uu vividly and attractively, this reader plays a vital role in the revitalisation efforts of the few remaining speakers and engaged community members and in the documentation and preservation of a language that is a most interesting testimony to the creativity of the human mind." Special thanks to the AW Mellon Foundation, the Endangered Language Fund, the University of Cape Town, the University of Kiel and the Harry Oppenheimer Memorial Trust for their financial support in this project.